Starring: Jackie Chan, Pierce Brosnan, Orla Brady, Sean Morrison, and more. Wow, is it really 2017 and I am reviewing a film starring Jackie Chan? What? Whatever, dope… WELL HERE WE ARE, FOLKS. 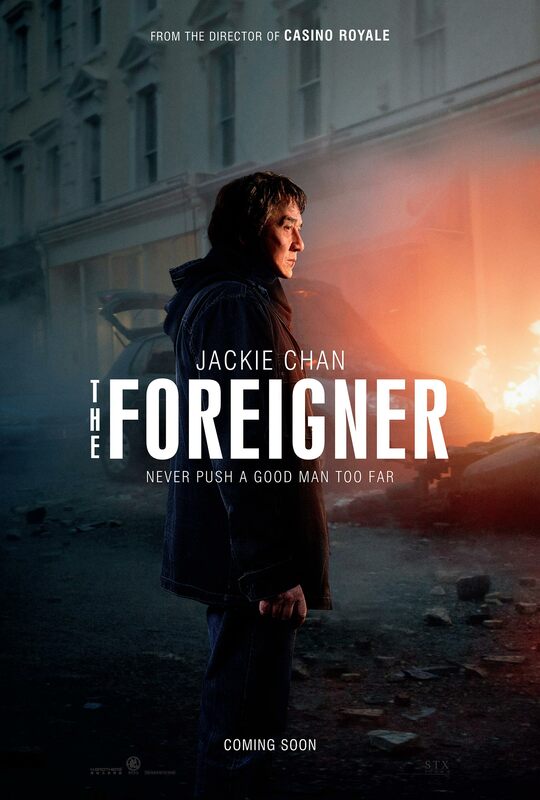 Yet another Oberrated Review and this time around I got my eyes on the Jackie Chan led film, ‘The Foreigner’. I have seen the trailer and handful of times placed in front of a couple other films I have seen within recent time and to be honest, it never really landed in my head as looking like a bad movie. If anything, I expected just another generic action flick starring some of Jackie’s trademark kicks. Well, I was partially right. And YOU, can find out which part I was right about just a weeeeee bit farther down the page. C’mon now, get scrolling… Everyone knows you don’t read the IMDB summary anyway. I teased it earlier; I did not expect much from this flick. To be fully honest, I expected cliche, I expected outrageous stories, and I expected superhuman killing ability. Basically I expected a ‘Taken’ film starring Jackie Chan. In some sense, it still was, but you get my point. ANYWAY, moral of the story is that I expected mediocre and I ended up with a solid and enjoyable action thriller with Jackie Chan facing off with Pierce Brosnan in what I would like to call an action chess match. Impressively enough, the story of ‘The Foreigner’ was quite complex. Like I said, it was like an action-packed chess match where Jackie’s character, Quan Ngoc Minh, was one step ahead of his counterparts every moment. Now, although the story was compelling and kept my attention for a large majority of the film, it did have moments where it seemed a tad long. The run time for ‘The Foreigner’ is six minutes away from hitting the two hour mark which further teases what I could mean by feeling a bit long. The complex story also has its moments where it does not compliment the long run time. While I appreciate the detailed complexity of the story, at times there were far too many moving parts to keep track of and some may get the feeling of wanting the point to be made. I am a bit 50/50 with the story but for the most part, I enjoyed it. My last bit with this shockingly enjoyable film is the joy it brought me watching Jackie Chan in action. I grew up very fond of martial arts films. Bruce Lee, Jackie Chan, Jet Li, Donnie Yen, Tony Jaa, the whole lot of them. But again, growing up I binge watched films with Jackie, Bruce and Jet. One of my favorites was always ‘The Legend of the Drunken Master’ starring Jackie Chan. Now I have Jackie back in a 2017 film and throwing his trademark kicks and being as crafty as ever in a film I never anticipated rating more than a 5. Despite some wild coincidences, moments that lagged a bit too much, and a multitude of moving parts that attempted to keep the story coherent, the film was still strong enough to keep up a high entertainment level from my perspective. The action thriller vibe of ‘The Foreigner’ fueled my excitement for the majority of the film. Jackie Chan returning to badass form was a thrill in itself to keep me watching. Overall, the film is a hidden gem for 2017. I am not saying it is a movie for the ages but it is no where near a flop or even the average outing I anticipated. So I made the bulk of this review at about 2 in the morning and my exhausted body kept typing but I do not think my mind was keeping up. I would also like to add a minor critique with the focus on Pierce Brosnan Vs. Jackie Chan. While this film places the spotlight heavily on Jackie Chan. The film splits the focus a solid 50/50 between Jackie and Pierce. Some may not be a fan of this, I actually am not the biggest fan of this as I expected it to be the Jackie Chan show. Not to say I still am not pleased with what I saw of Jackie and also not saying I am not pleased with Pierce’s story but a little more screen time with Jackie Chan would have done wonders for my opinion on the film. Still a solid 7/10. I enjoyed it. Posted in 2017 Movies, Movie Review.Tagged 2017, David Marconi, Jackie Chan, Martin Campbell, Movie Blogger, Movie Reviews, Pierce Brosnan, The Foreigner.